I started the year off with an extra $574.39, 5% of my $10,000 goal for 2016! This puts me a little shy of being on track, but that just means I’ll have to pick it up in the following months! I also won a sterling silver necklace from Shopprize worth about $35 USD. 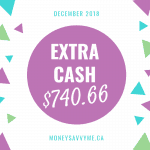 ​Where did your extra cash come from this month? Next Get 2 Free Meals! 50% OFF GREEN KID’S ENDANGERED ANIMALS DISCOVERY BOX!